I used to have a shopping problem. I routinely made more than I spent. I got used to living a semi-luxurious lifestyle, and I placed a high value on material things. Then one night I couldn’t sleep because I was so worried about the state of my bank account and how I was going to pay all of my bills. That’s the night I found personal finance blogs and I started taking steps to get my finances in order. I wish I could say that the peace of mind of knowing how much money and debt I have and knowing that I can pay all of bills each month without overdrawing my bank account is enough motivation to keep me going, but sometimes, it’s not. It’s not easy to change your entire mindset overnight and go from materialistic to not. No, I still find myself needing motivation now and then to keep me going with getting my finances in order. If you are the same way, don’t feel ashamed. 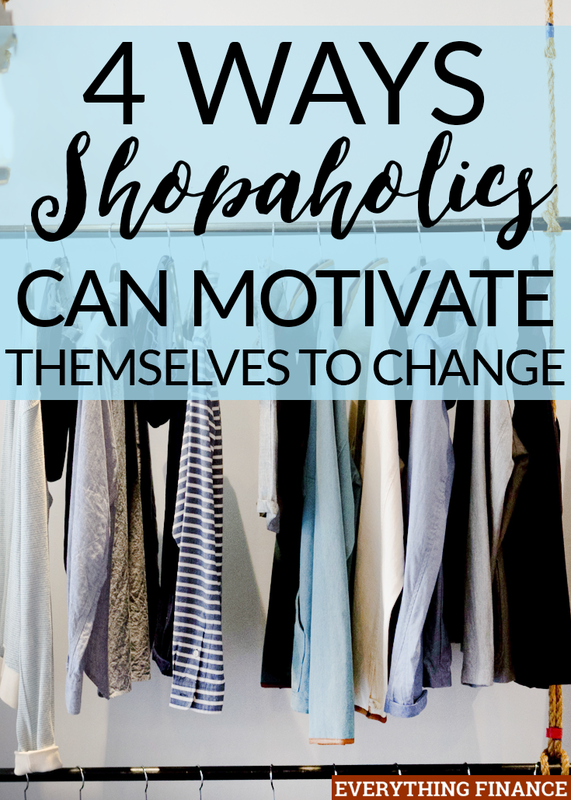 Here are 4 ways shopaholics can motivate themselves to make financial progress. One of the things I used to love spending money on was getting a pedicure. It’s very relaxing to me and I love having pretty toe nails. That said, I still love having painted toe nails. Plus, picking out new polish colors to try is one of my favorite parts about having a pedicure. Instead of paying to have a professional pedicure, I save money by buying new nail polish at the store instead. Yes, this still costs money, but it’s a far cry from the price of a pedicure at the salon. Plus, I can use the nail polish I buy many, many times before it’s all used up. I also treat these purchases as reward when I’ve done something to better my finances. For example, if I put extra toward my debt, then I might set aside a few dollars to go buy new nail polish. Your frugal reward doesn’t have to be nail polish. It could be cooking your favorite meal at home that you don’t have often because the ingredients are expensive. It could be going through the Sonic drive-thru to get a drink during Happy Hour. It doesn’t matter what you choose as long as it’s motivating to you. If you’ve got your shopping habit under control, you may be able to use shopping as a reward for making financial progress. You may only choose to go “window shopping”, or you may even choose to reward yourself by buying something you’ve been coveting. If you do decide to use shopping as a reward, be cautious. Only take cash for the item you are planning to buy so you can’t go on a crazy shopping spree and set yourself back financially. I recently did some window shopping in New York City. It was fun to look at (and even touch and drool over) some of the high-end things in the city. These are never things I’d put in my budget, even as a reward, but it was still fun to look around and spend some time shopping. I’m glad to say I walked away from everything without spending a dime! Speaking of my trip to New York City, I recently found a new passion I can use to reward my financial progress: travel! I haven’t traveled much, but now that I’ve gone a few places in the past year or so, I really want to travel more. Unfortunately, traveling is not cheap. Sure, you can use travel rewards on credit cards to “travel hack”, but since I’m still paying off credit card and consumer debt, I don’t trust myself with credit cards that much. After I returned from my trip to NYC, I decided to use travel as motivation to help me pay off credit card debt. I wagered with myself that if I paid off my credit card’s balance of just over $2,000, I could spend $150-175 on a flight to see one of my friends. This would scratch my travel itch, motivate me to pay off debt, and it would be a pretty frugal trip since I wouldn’t have to pay for lodging while visiting a friend. Travel may not be a new passion for you, but you could use other interests and hobbies as motivation to make financial progress. You could promise to buy yourself a new crafting tool if you enjoy scrapbooking, art, or some other creative hobby. Before I started reading and writing for personal finance blogs, one of my favorite hobbies was reading books. Now I do most of my reading online, but I wish I had more time to read books, too. This is why I made reading one of my free options for motivating myself to make financial progress. Whenever I have a no-spend day or I avoid an impulse purchase that’s calling my name, I try to set aside a few minutes to read something other than work-related research. Plus, reading is 100% free if you use the library or materials you already own. There are lots of other free ways to motivate yourself, too. You could give yourself a night off from regular duties by watching a movie at home or by binge watching something on Netflix. The key to motivating yourself with rewards for your financial progress is to find things that you care about and enjoy, but don’t necessarily have (or make) time for on a regular basis. These are the things that will be most motivating to you. Keep a list of them, and include what you have to do to earn each “reward”. Before you know it, you will be making more financial progress than you thought possible. How do you motivate yourself to make financial progress? Do you have to come up with rewards for yourself, or is the goal enough? If you’re a reformed shopaholic, what helped you change your habits?